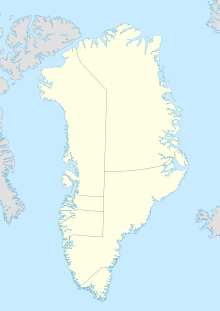 Paamiut Airport (Greenlandic: Mittarfik Paamiut) (IATA: JFR, ICAO: BGPT) is an airport located 1 NM (1.9 km; 1.2 mi) northeast of Paamiut, a town in the Sermersooq municipality in southwestern Greenland. It was built in 2007, replacing the old heliport. It is the only airport between Nuuk and Narsarsuaq capable of serving STOL aircraft of Air Greenland. ^ "Så fik Paamiut sin lufthavn". Sermitsiaq (in Danish). 1 December 2007. Retrieved 17 May 2010.